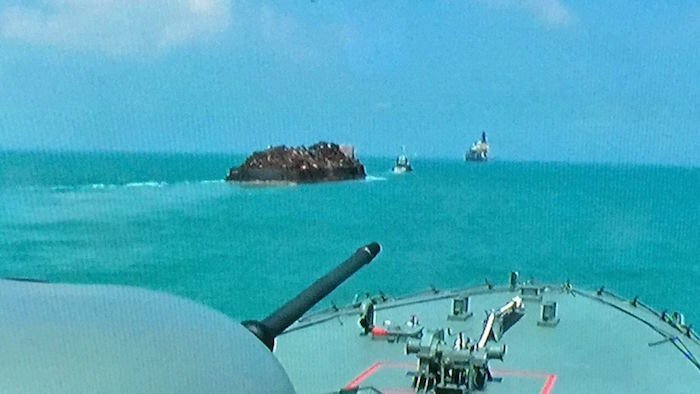 The Resilience, a warship belonging to the Singapore Navy, helped foil a pirate attack yesterday in the Singapore Strait. The ship came to the rescue of the tug, Permata 1, when it was attacked at around 0900 hrs. The pirates fled into Indonesian waters when they saw the naval vessel approaching. They were later arrested in Indonesia. Some property was stolen from the barge, but it was recovered later. None of the crew on the barge were harmed. The barge was then escorted back to Singapore by the warship (pictured) for inspection.